￼There is a telltale coolness in the air, leaves are changing and the scent of cinnamon beckons. It must be pumpkin season! What a better way to enjoy our favorite orange gourd than in a simple, comforting dish of Pumpkin Bread Pudding. It’s the perfect fall treat. Simple to pull together, it’s homey flavors will warm you up after a day crunching in the leaves. Whisk the eggs, milk or almond milk, half and half or coconut milk, sugar, pumpkin puree, pumpkin pie spice and vanilla and spices in large a bowl until smooth. Add the gluten free bread cubes and gently mix together until bread is coated with the pumpkin mixture. Let it sit for one hour to allow mixture to soak into bread. Gently stir mixture once to twice to allow for even distribution of the bread cubes. When ready to bake, preheat the oven to 375 degrees F. Put the pumpkin bread pudding mixture into an oiled deep dish 10” pie pan. Bake at 375 degrees F until golden brown and custard is set in the center, 45 to 50 minutes. Set aside while making the glaze. To make the glaze, whisk together the powdered sugar, maple syrup and 1 tablespoon of milk or milk substitute until smooth and lump free. Add remaining liquid if needed to thin the glaze to a pouring consistency. 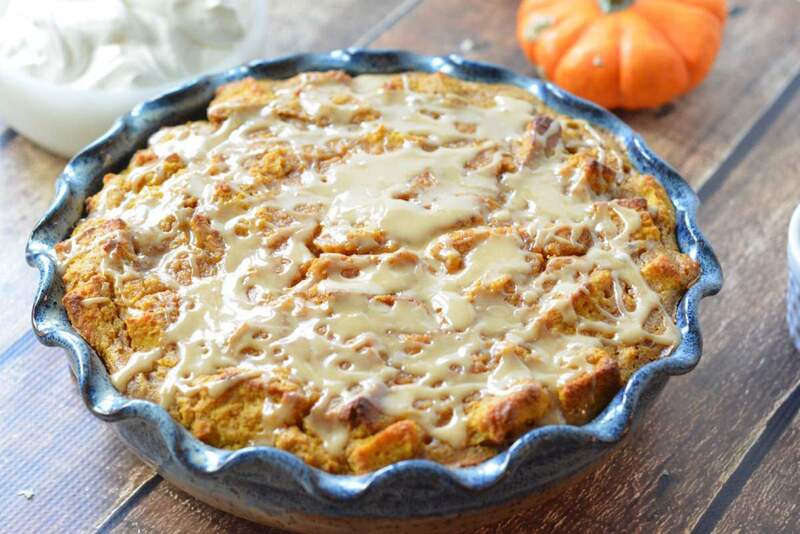 Drizzle glaze on warm pumpkin bread pudding. Serve bread pudding alone or with a scoop of whipped cream, whipped coconut cream or vanilla ice cream. Want more gluten free recipes? Follow along here and sign up below!